In the past two days, I've covered the arrival of over 30 bloggers, photographers, writers and outdoor adventure enthusiasts, otherwise known as the Columbia Sportswear #OmniTen, in Park City, Utah for the first #OmniGames. After the first day of competition, which involved five fun and unique tests, teammate Joshua Riggins and I found ourselves near the bottom of the pack and seemingly out of reach of the grand prize, a trip to Jordan. Though yesterday's post only covered the first five events, Columbia's Daniel Green announced all ten events to us on the first day, and as soon as I heard what events six through eight involved, my heart started pounding. Our sixth challenge was to complete the 25' high Canyon Adventure Course at Utah Olympic Park, an intermediate level ropes course with wire traverses and swinging elements that would test our balance and agility, among other things. Our seventh challenge was to complete the 55' high Summit Adventure Course, an advanced level course with tougher elements, and more of them. Finally, the eighth challenge, simply dubbed "Zipline to Drop Tower" by Utah Olympic Park, involved riding a 377' long zipline, finishing at the 65-foot high Drop Tower. From the Drop Tower, the only way down is a free fall. All three events were scored pass/fail; any fall on the ropes course equated to a failure. I've been afraid of falling from heights and generally uncomfortable with any activity that causes my stomach to drop (roller coasters, bumpy flights, etc.) for as long as I can remember. In life, I generally don't have to confront those fears unless I choose to, and for a long time, I did just that. I learned how to lead sport routes at my local climbing gym, went on climbing trips, and devoted time to working on my ability to deal with the idea of falling so I could be a better climber. Enough time that the majority of my posts in the early days of Adventure-Inspired are related to climbing. But at some point, roped climbing stopped being enjoyable. The stress of constantly forcing myself to push past my mental boundaries took the fun out of the sport. Bouldering has always been enjoyable; it's just me, no ropes, no worries about gear failing or my belayer not paying attention, no fear of dropping out of the sky without anything to stop me, just pure movement. Though I've bouldered recently, I haven't climbed on a rope or tested my fear of falling in over a year. In the #OmniGames, we could to opt out of any event we weren't comfortable with; Columbia made that clear. I didn't see that as an option. When I first learned Joshua and I were partnered up, he whispered how badly he'd love to see Petra, to visit the Middle East, and to go on what could be a life-altering trip. The point values associated with all three ropes course events were great enough that if I opted out of one, I'd take a giant step toward sealing our fate at the bottom of the leaderboard. What if I did both ropes courses, but opted out of the Drop Tower? What if I couldn't get control of my fear and fell on one of the ropes courses, losing points anyway? Would the #OmniTen members who knew I used to climb four days a week think I was ridiculous for not doing the Drop Tower because I was scared? Isn't being part of Columbia's #OmniTen about trying stuff? obstacle. Couldn't have done it without you! When we woke up on the second day of the #OmniGames, the weather had made part of the decision for me. Due to high winds, it wasn't safe to complete the Drop Tower event. We'd still test ourselves on both ropes courses, but rather than the Drop Tower, additional weight was added to the ninth event, dubbed Downhill Derby. Though some of the #OmniTen were disappointed, I was excited. I knew both ropes courses would be a significant mental challenge, but with help from my teammate and friends, I knew that fear was manageable. When we arrived at Utah Olympic Park, my stomach dropped. The ropes courses, stacked on top of each other, loomed in the distance. The wires, ropes, and obstacles hanging in mid-air looked impossibly high, physically do-able if I could stay in control. When I started climbing, I quickly learned that the more desperate I became not to fall and the harder I held on, the more likely it was that my fears would materialize. Joshua and I started on the 25' Canyon course after getting harnesses and helmets on. I took my time on each element and listened for his patient encouragement from behind me. Jon shouted kudos from his spot in front of me on the course.I knew I was physically capable of completing both courses, but if I let the fear take hold, I wouldn't just let myself down, I'd let my teammate down too. We both got through the Canyon course without falling, then had a long wait for our chance at the Summit course. I watched a number of my fellow #OmniTen fall on a few particularly challenging elements and when Joshua and I climbed the ladder up to 55' to start the course, I was terrified all over again. Heather and her partner Caleb were directly in front of me for the entire course and Joshua followed me. Both Heather and Joshua shouted words of encouragement during my entire journey. I heard shouts from #OmniTen members standing safely on the ground, demonstrating that even though we're competitors, we're also a big outdoorsy family. The support was incredible. I took my time, focused on my breathing, on not over-gripping elements that required forearm strength, using my legs instead of relying on my arms, and remembered everything I learned from facing my fears in climbing. And I got through it without falling. Heidi and Jon both ran up for hugs when Joshua and I finished, telling my how proud they were. Though relatively insignificant in the great scheme of things, I knew I'd just done something for myself that I'd remember for a long time. On the last element of the Summit course. After all teams had their shots at the ropes courses, we headed back to the Hyatt Escala Lodge to prepare for our next challenge. The ninth event, Downhill Derby, involved accumulating as many vertical feet as we could on the slopes at the Canyons Resort. I normally ski at a controlled pace, but after dealing with fear that morning, bombing down the slopes didn't sound so bad. down Doc's Run at Canyons. 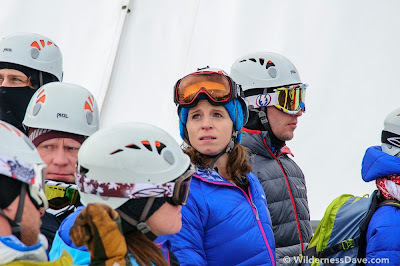 Though all four #OmniTen seasons had strong skiers and snowboarders to contend with (we missed you on this one, Steve! ), I knew Joshua and I could hold our own. After determining the shortest lift route we could get to the fastest from our starting point and the runs with the quickest manageable descents, Heather and I paired up for the full hour and a half to ski together. While riding the Orange Bubble, we talked about how interesting it was that we all had such differing perspectives on which #OmniGames events were scary. We skied Doc's Run a total of five times and the ungroomed Echo run for fun. Though I didn't see our Epic Pass results, by estimation, we accumulated around 10,000 vertical feet. Though the Park City-based competition was complete after event nine, we still have one more event to compete in. The tenth event, Charles Dickens, allots additional points for telling our #OmniGames stories any way we choose. I've had a blast reflecting on my experience so far, but still have one more story to tell - the gear story. Stay tuned! Overcoming your fears is never easy. Seriously so proud of you for rockin' those courses. You crushed that high course! I love that first photo of you though-- your concern is written all over your face! Yeaaah Katie! There is the girl who let me tag along with her up Algonquin in January :) I love your spirit my dear!